Dow Jones is targeting a down swing to between 11,650 and 11,750. 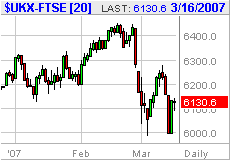 The FTSE performed right on cue, falling and hitting 6000 and then bouncing exactly as expected. 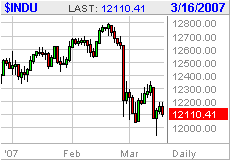 The Dow Jones did decline below the previous lows, but then rebounded above 12,000 to end the week at 12,110. The expectation still remains for the down leg to continue with further weakness expected especially in the Dow Jones towards its target of 11,750. For the FTSE I will be looking to see if it is able to stablise above 6000, even if new lows for the move are seen in the Dow Jones. However should 6000 fail, the FTSE is heavily supported in the region 6000 to 5900 so downside appears very limited at the moment. Looking further out, the action to date, increasingly does not signify an imminent crash, so once the bottoms have been confirmed the stock markets could stage a strong rally into April. For uranium bulls, news of ' New Uranium Mine Flood Tightens Uranium Supply - Prices to go Higher ' With $100 just around the corner. Make sure to visit the site regularly for the latest analysis on the direction of the stock market this coming week, especially as more action to the downside is expected.